(a) To inspect the garage door opener system, press each switch and check that the LED in the "HomeLink" logo illuminates as illustrated. If one or more of the switches do not cause the LED to illuminate, confirm that the fuse and the wiring to the garage door opener system unit is normal. 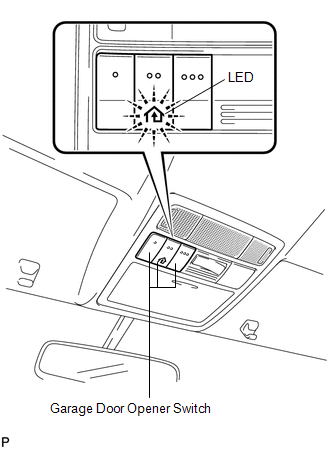 If the fuse and wiring are normal, and the LED does not illuminate, replace the garage door opener system unit located in the roof console box assembly. Use the KENT-MOORE "HomeLink" tester, and the KENT-MOORE handheld transmitter for this test. 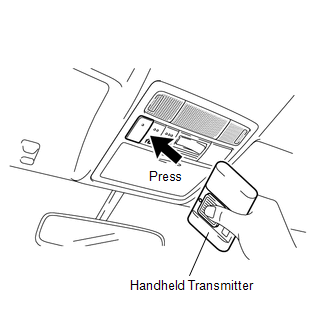 First clear the customer's transmitter codes, and then register the code of the KENT-MOORE handheld transmitter to the garage door opener system. (a) Check if the code of the KENT-MOORE handheld transmitter was successfully registered. 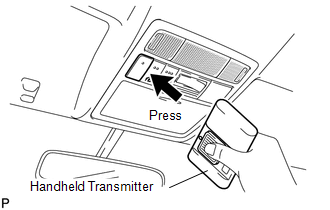 If the code of the KENT-MOORE handheld transmitter cannot be registered, replace the garage door opener system unit. (b) Press the garage door opener switch that was used to copy the signal from the handheld transmitter. 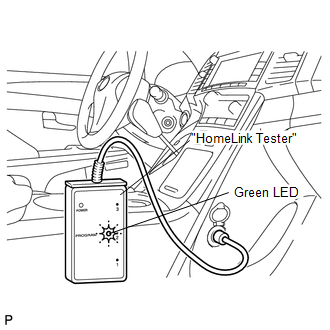 Check if the green LED of the "HomeLink" tester illuminates. If the green LED does not illuminate, replace the garage door opener system unit that is located in the roof console box assembly. (c) When the inspection is complete, re-register the customer's handheld transmitter codes.